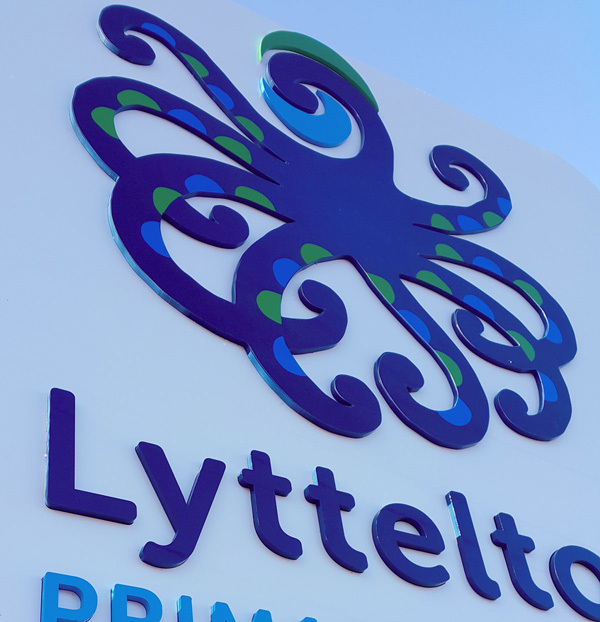 Toward the end of 2015 I was asked if I would like to be involved in the branding of Lyttelton Primary - a newly merged school. Their new logo is the result of some great consultation and collaboration between myself, the school community, and the local hapū. Lyttelton Main School and Lyttelton West School were closed as a result of damage caused during the Christchurch Earthquake of 2011. This saw the creation of Lyttelton Primary - the merging of these two schools. Five years on and the construction on the brand new school is complete. Staff, students, and families are now enjoying their wonderful new facility. In preparation for its opening, I had a meeting with the school principal, Diana Feary, and the school leadership team to discuss a new logo which could encapsulate their new school's mission, vision, and values. Over the course of the discussions we found the perfect image for their new logo. Meet Te Wheke (The Octopus). 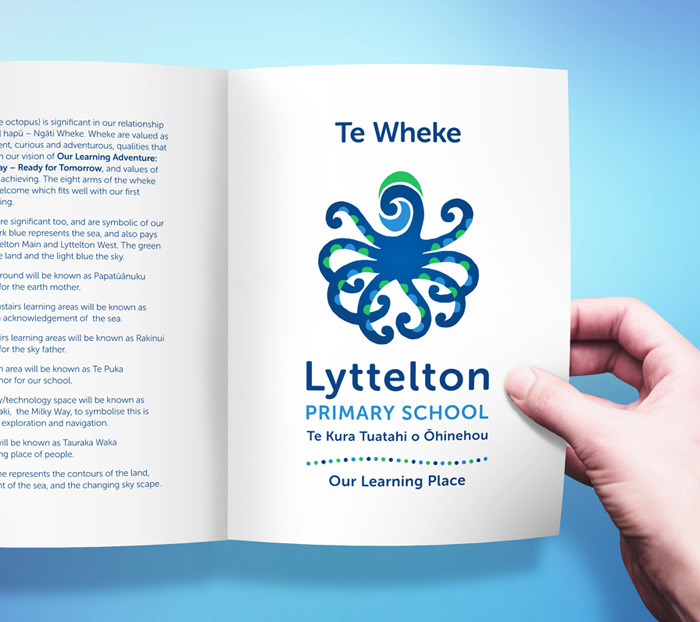 Te Wheke (the octopus) is significant to the local hapū of Lyttelton – Ngāti Wheke. Wheke are valued as being intelligent, curious and adventurous - qualities that align well with Lyttelton Primary’s vision of “Our Learning Adventure: Thriving Today – Ready for Tomorrow”. It is the perfect metaphor for Lyttelton Primary School students who are colloquially known as ‘Lyttel Adventurers’. The head of Te Wheke represents the school. It is surrounded by sea on one side (light blue) and hills behind (green). Lyttelton is a port town surrounded by steep hills. The new school overlooks the harbour. The first three tentacles on each side represent their three school values (Belonging, Inquiring, Achieving) and their three Learner Qualities (Our Learners, Our Learning, and Our Place). Each value and learner quality is embraced by all students, symbolised by the four suckers on each tentacle. These also represent the four houses (Harakeke, Totara, Kōwhai, Raupo). 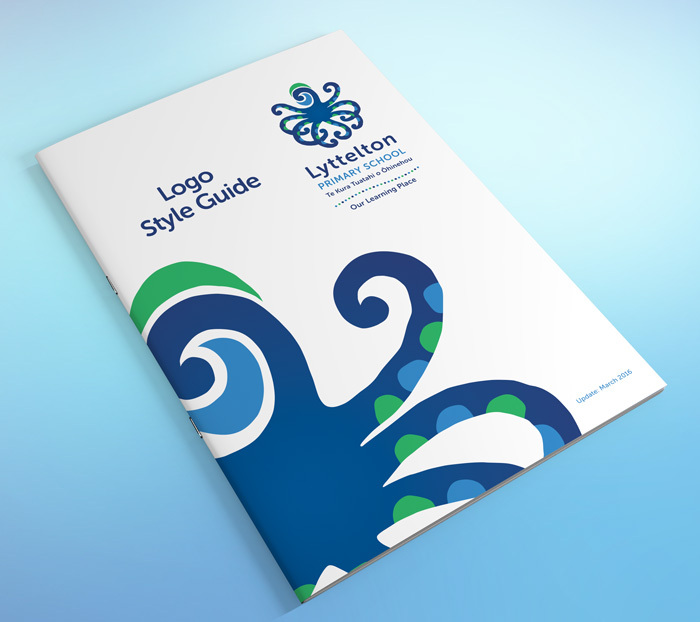 The two back tentacles are associated with the nickname given to Lyttelton students - 'Lyttel Adventurers'. 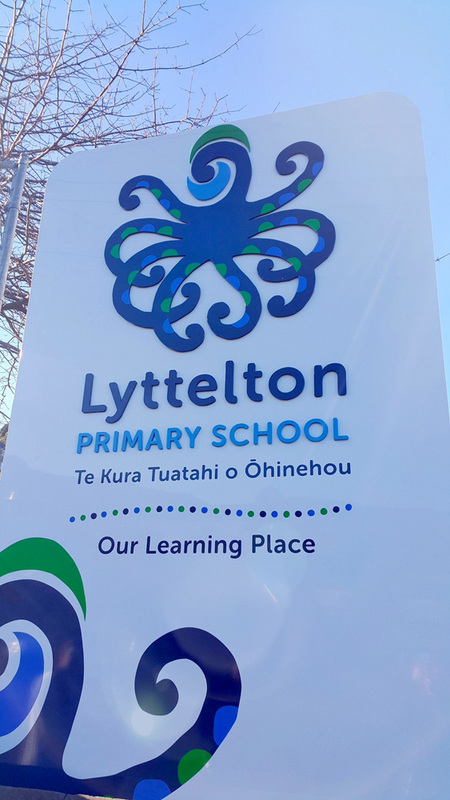 They are reaching out to explore their surroundings while the overlapping tentacles demonstrate the inclusive caring nature of Lyttelton students. Together, the eight arms of te wheke welcome everyone to their school. The dark blue represents the sea, and also pays tribute to Lyttelton Main and Lyttelton West Schools (their school colour). The green represents the land and the light blue the sky. The logo and branding has an organic look. Edges are rough and uneven which ties in with the creative nature of school and learning. Often the road to learning is challenging. The dotted line echoes the waves of the sea. 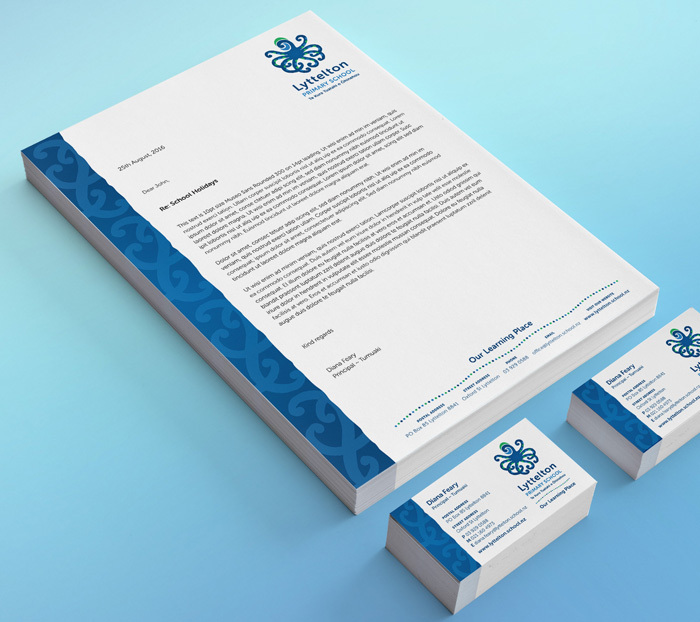 The blue textural strip seen in the stationery (made from the tenticles in the logo) is an additional branding element which adds to the overall modern friendly organic feel. The typeface is Museo Sans which compliments the logo symbol nicely. 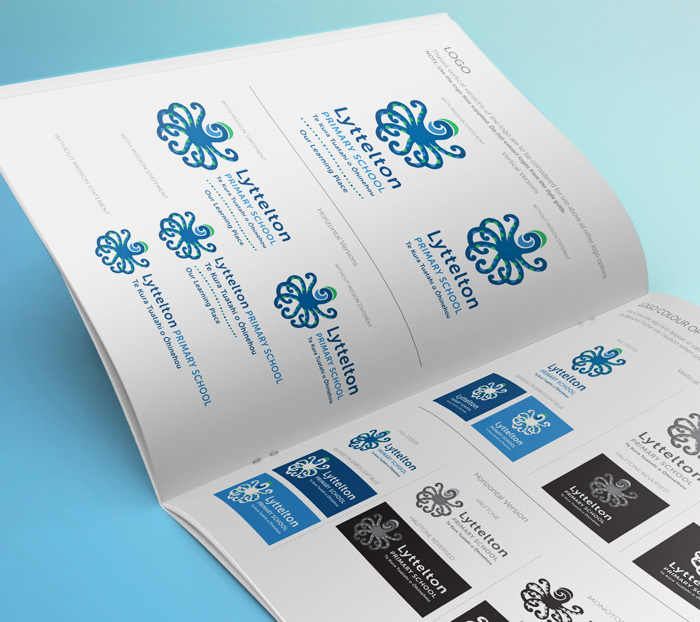 The process of creating a logo and branding for a newly merged school can be tricky. It's important to be both sympathetic to the past as well having the vision to forge a new path forward that unites staff and families under a new banner. 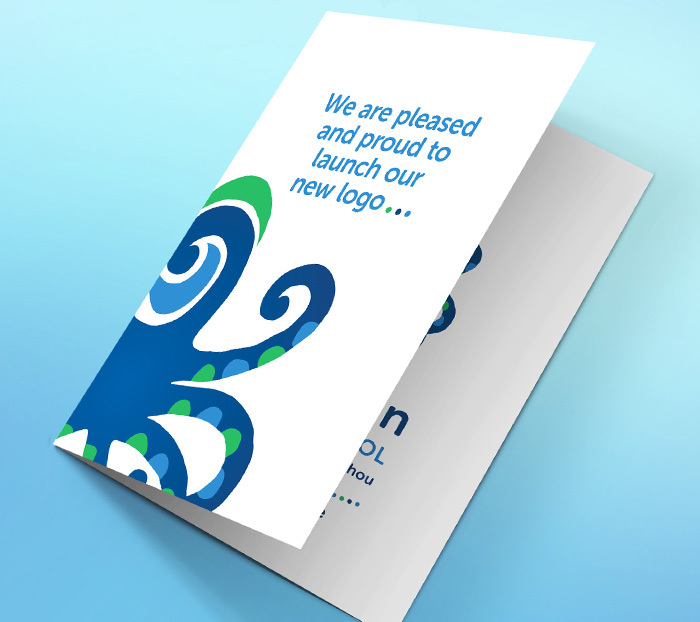 A cleverly crafted new brand image can go a long way in helping with this process. Are you a newly merged school? It can be quite tricky making sure that any new logo and branding is done well so that the school community are on board. If you would like to know more the process I went through with other schools, drop me a line.